Towel Day is an informal holiday celebrated on May 25 by the fans of Douglas Adams, English science fiction writer. Adams is best know for his The Hitchhiker's Guide to the Galaxy series. Towel Day was created as a tribute to Adams two weeks after his death in 2001. Douglas Adams died of a heart attack on May 11, 2000. Three days later, the article that began Towel Day was posted at an open-source forum. The article's author proposed to honor Adams' memory by celebrating Towel Day two weeks after his passing. 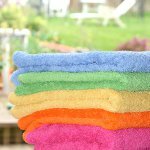 The commemoration was named Towel Day because, according to The Hitchhiker's Guide to the Galaxy, a towel is the most important item a hitchhiker can have. On May 25, all Douglas Adams fans are encouraged to carry a towel with them everywhere. Towel Day immediately became popular among the fans, and its celebration started to spread across the world. Fans use social media to spread the word about the holiday, using the hashtag #towelday. They organize meetings, contests and other events and activities to demonstrate their appreciation for Douglas Adams and his works. Towel Day shares the same date as two other fan observances: Geek Pride Day created by Star Wars fans and the Glorious 25th of May celebrated by Terry Pratchett fans.